Sister Tesa Fitzgerald is the founder and director of Hour Children. Based out of Long Island City, Queens, Hour Children takes its name from the critical hours that govern the relationship between an incarcerated mother and her child – the hour of incarceration, visitation hours during the prison term, and the hopeful, often intimidating, hour of the woman’s release and reunification with her family. 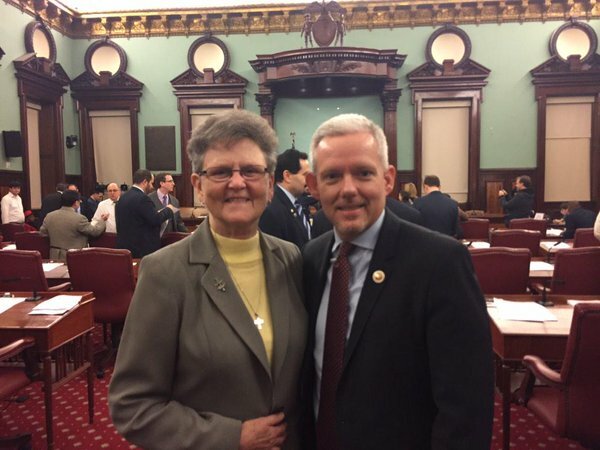 Sr. Tesa founded the organization in 1986, when it initially brought care to the children of women in Bedford Hills and Taconic Correctional Facilities on Long Island. Now, the organization’s services are composed of both prison and community-based support programs like case management and therapeutic services, adult mentoring, vocational training, and child day care and teen group facilities, as well internship opportunities at the organization’s community food pantry, three thrift shops, and employment office. Apartment housing is currently available up to 75 families at a time, with expansion not far off the horizon. In 2014, Sr. Tesa received the prestigious Opus Prize, a $1 million award for those who inspire and promote humanitarian and social work, which she pledged to invest in additional housing for Hour Children. With a U.S. prison population composed overwhelmingly of male offenders, incarcerated women are frequently reduced to a shadowed demographic. Of the 58 prisons in New York State alone, a mere three are used for the detainment of females. Working first with non-profit group Providence House in the 1980s, Sr. Tesa paid visits to New York’s women’s prisons, listening to the stories as the inmates were prepared to tell them. During this time, she became aware of the outcast status of formerly-incarcerated women, their pain, and the very real possibility of homelessness that awaited them upon being freed. “There is a need to specialize,” she says. “When you specialize in something, you become a little more savvy about it. You can advocate for people. You learn. You can become the spokesperson for a population that doesn’t have a voice.” Translating the cries of the silent, Sr. Tesa soon realized the need to help keep the mother-child bond strong during this time of divide. In order to do so, she wasted no time in becoming a licensed foster mother. 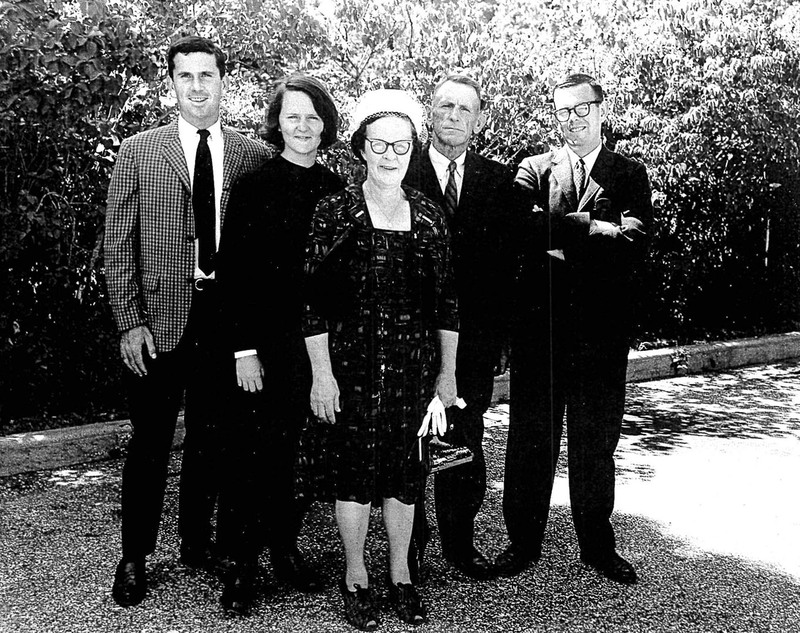 Sister Tesa, second from left, with (l-r) her brother John, mother Catherine, father John, Sr., and brother Frank, on her day of entrance into the Sisters of St Joseph, in Brentwood, New York. Maureen, Sister Tesa’s sister, is not pictured. To say that Hour Children offers these women a second chance would be inaccurate, says Sr. Tesa, who is lightning-quick to explain that many ex-offenders never had a first chance to begin with. “The women I’ve met over the last 30 years in doing this, they didn’t have a family network of support. As a result, their early lives were in chaos. They lived in poverty, whether it was physical, emotional, or spiritual, and as a result, they sought life in negative ways. Drugs looked good, drinking looked good, men looked good. The streets drew them. When they come to us, whether they come with a child or as a single woman, we provide a community.” The recidivism rate for women who become involved with Hour Children is just 3.5 percent. The model Hour Children supplies is as diverse as it is welcoming, encompassing both mothers and childless women, the young and the old, first-time offenders and those who have served multiple sentences, people of all races and religions willing to work towards future fulfilment for themselves and their loved ones. 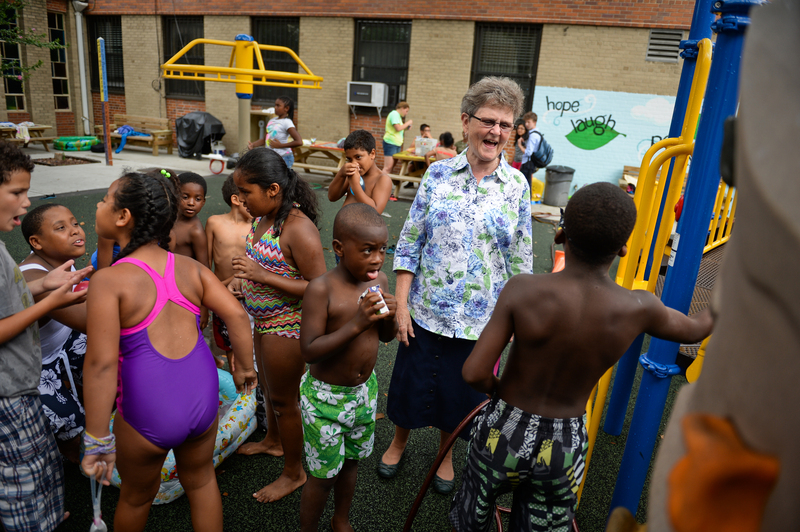 Sister Tesa with children at the Hour Summer Camp and After-School Program in Long Island City. In a 1950s Irish Catholic cul-de-sac of the Hewlett hamlet in Nassau County, New York, the Fitzgerald family were certainly no strangers to the importance of structure. It gave pattern to their otherwise simple lives. Tesa’s father John was a gardener from Lative, County Kerry, and her mother Catherine was a maid from County Donegal. Young Tesa and her three siblings slept in a fold-out bed on the porch of their tiny bungalow. Her parents made clear what was really important. Despite contending with the difficulties laid upon all diaspora Irish, Catherine worked tirelessly to provide her children with the resources they would need for an auspicious future. Sr. Tesa remembers she often saw her in a black dress and white apron, knowing nothing of it being a housemaid’s uniform, thinking only that her mother looked beautiful. With the unshakeable love of a mother-child connection inspiring the constant forward momentum of Hour Children’s work, success stories are bountiful. An experience particularly close to Sr. Tesa’s heart is that which she shared with Julia, the daughter of a teenage girl wrongly incarcerated during the New York drug raids in the 1980s. After the death of her maternal grandparents, Julia became one of Sr. Tesa’s first foster children. She would leap at any chance to attend visitation hours, “sitting in the back seat and talking to her imaginary friends about what the visit was going to be like, what her mother would be wearing, what color lipstick she would have on,” she says. The effects of Hour Children upon the lives of the families it reaches are manifold – loving relationships are not only saved, strengthened, mended, and recreated, but every day, new ones are forged in ways even Sr. Tesa cannot predict. The fact that Sr. Tesa has made her own home in the Astoria Hour Children housing facility should come as no surprise. For her, Hour Children is no mere project, but a way of life and a calling to represent a population so often left out in the cold. Embedding herself in the daily rituals of it all has allowed Sr. Tesa to transform Hour Children into that which it strives to inspire – a close-knit family. Olivia O’Mahony is Irish America’s editorial assistant and copyeditor. Born in New York and raised in Lucan, County Dublin, she holds an international degree in English literature and anthropology from Maynooth University. She currently lives in Manhattan. I personally know Tesa & am so happy for this recognition of her & of her work. I can’t see a more deserving person. Awesome work she is doing. Thank you for recognizing her efforts.